You are currently browsing the archive for the meta category. 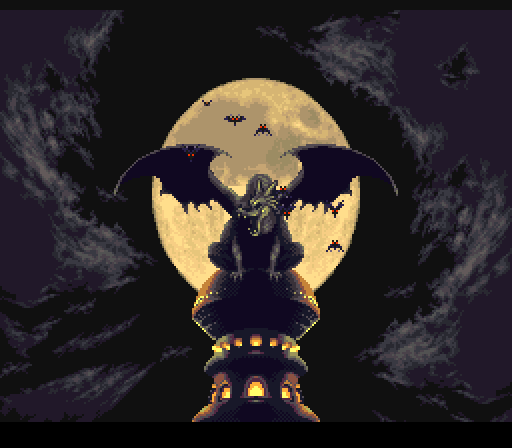 There’s people doing retro games now. I think it might be interesting to discuss what they’re evoking, and how they can fail. If people don’t use interpretation, or reading between the lines, or trying to find fun in a game, they tend to love games that I only like, and they tend to hate games that I’ve been able to enjoy. By interpretation, I think I mostly mean something akin to the concept of “active reading.” In literary criticism, this often means looking at a work both as the text on the page, and looking for the work as what the text could be interpreted to mean. So, for example, you might take Freud and say that he’s saying A, but he means B, and B is a lot more interesting than A. If someone’s just looking at what the game does, they may like a game with a stronger theme to the plot (but may ignore the clunky ways that the theme is set out.) If they can’t look past a bad translation, they may ignore what the plot is trying to say in favor for how poorly the plot is saying it. I think it might help to discuss specific games to try to explain what I mean. A cutscene shows bats fluttering up and away from the fortress with a large moon in the background. This plays when you approach Magus' fortress. In Cosmo Police Galivan, you have two experience bars. One is for levels, which governs HP amounts and CP amounts (basically magic.) The other is for your weapon. If you die, you lose level experience but not blade experience. This means that new areas are incredibly fustrating since you often need CP to open doors and do special attacks. However, death removes your CP, and it removes your level experience (which governs the limit of how much CP you can have.) A friend of mine played the game using cheats for the blade experience and refilling HP. He got stuck at one point because he needed to grind up his levels to have enough CP for an event. While death in the game didn’t throw you that far back, it is an inconvienence, since it hurts you in ways that actually does matter. Death in a rogue-like such as Dragon Crystal is usually a learning experience. You die so you can learn how to survive. On another webforum, a person declared that games without choices are merely “arcade sequences between cut scenes.” They were talking about Assassin’s Creed, but they were looking for RPGs to play with these “choices.” Unfortunately, this concept of “difficult choices” is something that I personally loathe. I think it might help to explain why I have that position. I think a lot of people who complain about boredom in a JRPG have some valid complaints. After all, many games have padding, confusing sections, or simply poor layouts or plans. This means that the average player likely will be in an area longer than needed. The longer you’re in an area, the more likely you are to see repetitive things – from landscapes, to battles, to treasure. 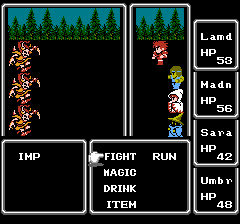 The imps in the NES version of Final Fantasy resemble the goblins in the GBA version of Final Fantasy. I’m debating about doing another “Actual Play” session. Maybe see if people have some time free over the holidays to play an hour or two of various games, or pick a specific one. Also thinking of doing an article on Wizardry or Might and Magic. One problem with the series is that it’s hard to explain why the game was so popular in the day. Another problem is that the series is basically a history lesson. 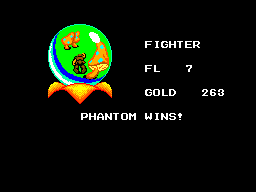 To this day, there’s Wizardry references popping up in various games and it’s mostly as a nostalgia thing. Trying to explain nostalgia is hard without having the history behind the series. Some early games required a FAQ (frequently asked question.) Sometimes, this was needing a manual as a form of copy protection. Sometimes it was simply due to limitations in the systems. I’m including things like “need to draw a map” with FAQs because if you’re not willing to do the work, you cannot play the game. Magazines usually included tips from the publisher with the review to encourage people to buy the magazine. A constant argument on the pen and paper end of things is that there’s no good role-playing games out there. This usually is followed up by “My GM let us do this and that to win, but a game can’t let you do that,” or some complaints about limited character generation. I think some of this comes down to what you want out of a game. Think of it this way. If you’re in a game to get immersed in the soap opera like problems and the characters interacting with the conflicts, then you want to get rewarded with story elements and to find out more details about the characters. In this kind of game, you may get pre-made characters (you’re the six children of the king each with a deadly secret, say,) or criteria for how to make the character. Exploration might have you discovering secrets, changing the status quo, or finding out new things about the world you live in. In many games there’s a pattern to how the game expects you to buy equipment. Obviously, equipment is mostly just shifting around stats, but how you buy it, and how buying it changes the game is relevant. For example, if a game requires you upgrade to the latest set of armor, you may end up having to grind for money. If the game balances enemy difficulty on the latest set of armor, you may find yourself in a lot of danger until you can get the right set of equipment. If the game uses status effects, you may have sets of armor that focus on reducing various status effects. 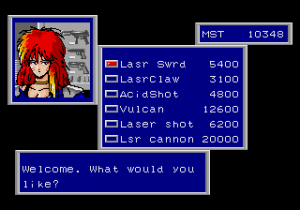 Phantasy Star II has a Dragon Quest like system for equipment. It encourages you to buy expensive weapons and then save money for armor. I should probably finish the Dragon Quest / Warrior series. That’d mean doing articles on Dragon Quest V and Dragon Quest VI. The seventh and eighth games should get articles as well, but they’re a little more difficult to properly illustrate. 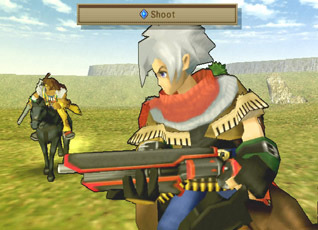 Wild ARMs already has a lot of images uploaded, so a series overview wouldn’t be that bad. It is a little late for the era I’m talking about.